The Mykonos Andros ferry route connects Cyclades Islands with Cyclades Islands and is currently operated by 3 ferry companies. 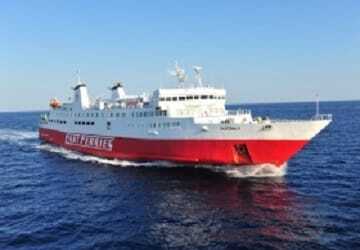 Cyclades Fast Ferries operate their crossing up to 14 times per week, Sea Jets 14 times per week & the Golden Star Ferries service is available up to 7 times per week. There are a combined 35 sailings available per week on the Mykonos Andros crossing between Cyclades Islands and Cyclades Islands and with 3 ferry companies on offer it is advisable to compare all to make sure you get the best fare at the time that you want to travel. Prices shown represent the average one way price paid by our customers. The most common booking on the Mykonos Andros route is a car and 2 passengers. The Greek island of Andros is located around 10 km to the south east of the island of Euboea and 3 km to the north of the island of Tinos and is one of the Cyclades group of islands. Andros is roughly 40 km long and 16 km wide at its widest point. The island, with a rich maritime tradition, is also the northernmost of the Cyclades island. The island's inland and coastal terrain is characterised by mountain ranges interrupted by plains, vegetation and streams with a rocky coastline interrupted by sandy beaches. The island's capital is named Hora (which is Greek for main village) where visitors will find a mix of architectural styles ranging from typical Cycladic, to neo-classical and medieval. Wandering around the village, visitors will be greeted by narrow streets, lovely churches and museums, a large square and a number of cafes and restaurants. On an islet that is connected to the main island there is also a Frankish castle, complete with an arched stone bridge that dates back to the 13th century. From the island's port, ferries can be taken to the ports of Piraeus and Rafina along with the other islands in the Cyclades and Ios, Santorini, Kimolos, Naxos, Anafi and Amorgos.